About the elusive satisfaction of designing something great. When was the last time you made a design that you felt was complete and truly perfect? We designers use the term “pixel perfect” to describe our ideal: a beautiful, flawless design. Such a design instills pride when the designer looks back at it, rather than the slight embarrassment we usually feel about old work. Sitting in a portfolio, the pixel perfect design is the embodiment of what we’ve spent all those countless hours honing our skills to achieve. I’m sitting here in my living room spinning Kid A on vinyl (my favorite Radiohead album), remembering a horrifying design I made a year ago. I was sitting in this exact chair listening to the same music, typing some article or another, unable to go back into my home office and finish the design. It was a horrible design, and I was ashamed to put my name on it. But I had to get paid. I’m sure you know that feeling well. As designers (or as people who make things in general), we’re always looking for that high that comes from making something great. Maybe it’s why you began this career in the first place. However, opportunities to do our best creative work are elusive. We have to make compromises because we work with other people: copywriters, creative directors, developers, clients, and so on. Or, we compromise because of time or budget, which usually seem like excuses. Of course sometimes a design benefits from collaboration, but you know it in your gut that sometimes you give in to compromise because you can’t figure out another way forward. Early in my career, I learned not to attach personal satisfaction to my design work. 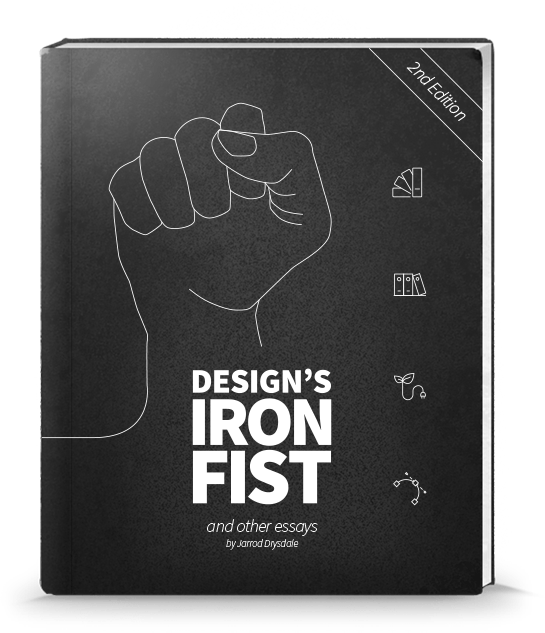 “I don’t express myself through design” was my badge of honor and my claim to martyrdom. There I was, a creative professional, declaring that I had no emotional attachment to my work. The benefit to the client, so went the suggestion, was that I could adapt to any style and communicate any message. I wouldn’t steer the design to match my personal taste and risk its success out of—what I casually implied other designers indulged—narcissism. I was an expert communicator because I was detached. However, a few years ago, I started writing like crazy and eventually acquired a new skill: audience research. My time spent in audience research has taught me that I had it all wrong: designers should care about their work, and even more so, care about the people who will see it. If you care, you will work to understand those people through research and empathy. You will ensure the design speaks to them clearly. Without understanding, design is at best an assumption and at worst impotent. So, I’m back to pursuing that elusive high of a perfect creative work. I’m learning to teach the people I work with what it means to make a pixel perfect design: we’re not just making something pretty, but we’re connecting people. To connect with others, you have to invest something of yourself, because that’s just how relationships work. I’m unlearning all those old habits of detachment, which if I’m truly honest, despite thin justifications, I only developed to avoid the disappointment of compromising on my designs. I’m throwing myself into every new design like I did back when I was working at my first gig; back when starting every new project was better than opening a birthday present. A design that connects people who otherwise couldn’t understand one another. I’m honestly not sure if it’s possible to make a perfect design like that. But I still think it’s worth trying.